Traditionally, in NZ as around the world, electricity meters have been purely electromechanical devices that did not contain any sort of electronics. Until recently, most NZ homes had the type of analogue meters known as “Ferraris” meters. That began to change a few years ago when companies began to install electronic smart meters which produce radiofrequency radiation (RFR) in the microwave range to transmit information about electricity use. Currently, when people in NZ tell their electricity company that they do not want a smart meter, or want an existing smart meter removed, the first option offered by many electricity companies is for the modem (which produces the RFR) to be removed from the smart meter, rather than for the entire smart meter to be removed and replace with a non-smart meter. There are a variety of alternatives to smart meters in use in NZ including the Itron ACE 1000 SMO meter – which is an electronic meter with an analogue barrel display* – and analogue (purely electromechanical meters otherwise know as “Ferraris” meters). Electricity companies frequently make claims to the effect that removing the modem from a smart meter makes it into a normal meter. The purpose of this post is to discuss the differences between a traditional analogue (Ferraris) meter and a smart meter which has had its modem removed. In terms of its functionality, a Ferraris meter simply measures electricity use and this use can be read from the mechanical register by a home owner or meter reader and this information supplied to the electricity company so that the household or business can be billed correctly. Ferraris meters have no electronics and therefore no ability to store data. In terms of the health risks, it is important to keep beds and other furniture where you may spend a considerable amount of time at least one metre away from a Ferraris meter (and preferably 2-3 metres) due to the high magnetic fields in close proximity to the meter. The meter works by creating two opposing magnetic fields which then drive the disk depending on power usage. Other than the high magnetic fields from the household wiring and the metering coils, the Ferraris meter has no health risks. Some* (but not all) smart meters on the NZ market had a removable modem (also known as a “chip” or occasionally “network interface card” or the “comms” device within a smart meter ). The modem is responsible for sending information about electricity use back to the electricity company and/or lines company at about the 900 MHz frequency for meters connected through the cellular network. Removing the modem prevents the smart meter from being able to transmit data wirelessly, and in most cases will stop the smart meter from producing the RFR that poses health risks. However, some smart meters in NZ also contain ZigBee chips or modems which also create radiofrequency radiation (RFR) in the 2.4 GHz frequency range. (The purpose of a ZigBee is to communicate with any smart appliances that are in a home.) In some smart meters, such as the Landis+Gyr E350 series in which a “silver springs” network interface card has been fitted, the main modem and ZigBee chip are part of the same network interface card, so removing the network interface card will solve the problem of the RFR from both sources. In other smart meters, such as the EDMI Mk7A, there is apparently an option for a ZigBee chip; however, it is my understanding that most smart meters in NZ currently do not have a ZigBee chip included. Regardless, in order to prevent a smart meter from producing RFR, the modem must be removed or disconnected, and any ZigBee chip (if separate from the modem/network interface card) should also be removed as well. One slight advantage of an electronic meter over a Ferraris meter is that there could be slightly lower magnetic fields, but this is not a good enough reason to recommend an electronic meter over a Ferraris meter. Another issue that is also of interest is the possible increase in electricity charge that is often noticed when an electronic meter is installed. The older style Ferraris meters, due to the way it measures current flow by the two opposing magnetic fields, is reasonably slow reacting to surges of power use. A surge or inrush of current is common when an appliance is turned on, particularly if it has a motor. The electronic meter on the other hand very accurately measures these very brief surges of high power consumption that were not normally registered in the older Ferraris meter and this can lead to significantly higher billing, often 20% or more. It is debatable whether this extra billing is fair as it can be a considerable increase in billing for no increase in actual usage. Also, the so called “energy saving” appliances and lights that we are being encouraged to use may actually have higher inrush currents and increased billing over older appliances, increasing the billing even further. Removing the modem from a smart meter will not change how it measures electricity or decrease your bill if your bill went up after the smart meter was installed. Smart meters have the capacity to measure reactive power as well as usable electricity and if reactive power (which is useless to the consumer) is added to the bill, the bill would rise without any change in electricity consumption. I do not know whether any domestic customers are currently being billed for reactive power in NZ. Hopefully changes in billing transparency should prevent companies from charging for non-usable reactive power, if any NZ companies are presently doing this. Having a smart meter that has had its modem removed may also leave your vulnerable to Time Of Use (TOU) pricing, should your electricity company choose to institute this, because the smart meter can store data at regular intervals and this data can be used to charge different rates for electricity used at different times of the day. Analogue (Ferraris ) meters and those brands of electronic meters which DO NOT have not capacity to store data provide protection against Time Of Use Pricing being inflicted on consumers. If you value your health, privacy and financial well-being, a Ferraris meter is the best sort of electricity meter. However if you are having difficulty getting your electricity company to agree to remove your smart meter, accepting the offer of the removal of the modem (plus any ZigBee chip it may contain) from the smart meter will reduce the health risks from a smart meter as the meter will no longer produce pulses of microwave radiation. 2) Organise to be present when the technician calls at your home to ensure the job is done properly. 3) Get an agreement in writing that the modem (and any ZigBEE chip) will be removed and will not be replaced. Website editor’s note: If you would like to get updates on the smart meter issue in New Zealand please join the free email list at www.stopsmartmeters.org.nz. There is also a search option at www.stopsmartmeters.org.nz to allow you to find articles about other topics of interest on this website. *Meters on the NZ market which can have a removable modem include EDMI series meters, Landis+Gyr E350 series smart meters and General Electric (GE) SM110. To the best of my knowledge, the Elster gREX meter CANNOT have its modem removed. I have not heard of cases where this has not been done properly but I have received reports of contractors installing smart meters against home owners/occupiers express permission so I think it prudent for people who want the modem to be disconnected and/or removed to be present to witness that this has actually been done. Locking your meter box also protects you have from having the modem re-installed by another party (such as the smart meter owner, which is often a different company from the electricity retailer) if the meter owner or its agents is unaware of the agreement you have with your electricity company. If you lock your meter box and there is no window to allow a meter reader to read your meter, you may need to make an agreement with your company that you will phone in or email meter readings to your company on a regular basis. You could offer to include a photo of the meter (as proof that you are providing an accurate reading) if you have a digital camera and can email or otherwise send this image to your electricity company. I decided to investigate the issue of how smart meters may be used to remotely control heat pumps (without the householder’s consent) in more detail. My initial (and as it turned out, incorrect) information about heat pumps having mandatory “demand response functionality” came from the website of the Parliamentary Commissioner for the Environment. In following up on this issue, I first tried to access the current standard for heat pumps and found that while there was one in existence, I could not access it unless I either went to the central library in Auckland (not very practical) or paid a couple of hundred dollars (not feasible either). I therefore sought the advice of the Energy Efficiency and Conservation Agency (EECA). 1) That having “demand response functionality” is not currently mandatory in NZ. 2) That some of the heat pumps on the NZ market do have “demand response functionality”. This “demand response functionality” cannot be used to turn the heat pump off altogether but it can be used to turn the heat pump down to its lowest setting. 3) That manufacturers can choose to show that their heat pump has demand response functionality on the label on their heat pump. You can click on the image to make it larger. The tick mark which is circled in red indicates that the appliance has “demand response functionality”. Presumably heat pumps that have “demand response functionality” will contain a ZigBee and/or some other radiofrequency radiation (RFR) producing device to allow the appliance to communicate with a smart meter. I have no idea whether appliances which have “demand response functionality” will be producing RFR all the time or intermittently or whether the default setting for the appliance will have the “demand response functionality” switched off. However, if you do not want extra RFR in your environment and/or you do not want to risk your electricity company being able to control your heat pump via a smart meter in your home, it would seem prudent to avoid buying items with “demand response functionality” indicated by the label. Please note that I do not know whether it is mandatory for manufactures that make appliances that have “demand response functionality” to declare this capability on the label. For this reason it would be prudent to ask the retailer whether any appliance you would like to buy has any “demand response functionality”, regardless of the label. 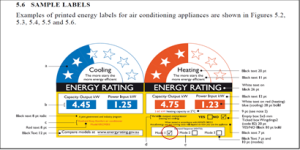 If you already have a heat pump and it not longer has its label, please see the info at the bottom of this post. So there you have it. It does appear that some smart meters in NZ (those than contain ZigBee chips*) may have the capacity to remotely control some heat pumps, although this feature may not yet be active. It also appears that there are heat pumps on the NZ market which have “demand response functionality” which could allow them to be controlled via a smart meter. It is possible other smart meters contain ZigBee chips; some EDMI smart meters which are very common in NZ have the potential to include a ZigBee chip. If you are in any doubt about whether the smart meter at your home has a ZigBee chip, your electricity retailer should be able to tell y0u. At the link above you will see a row of black buttons…one is Download CSV. Click on this and you will get an Excel file. Open the file. The field that indicates whether a heat pump has “demand response functionality” is labelled “BE” at the top of the column. The word “TRUE” in the “BE” column indicates the heat pump has “demand response functionality”. The word “FALSE” in the “BE” column indicates that a heat pump does not have “demand response functionality” . Can smart meters be hacked to cause power blackouts? Smart meters and the purportedly “smart grid” may potentially increase the risk of further black outs, as “black hat” hackers are set to reveal soon, according to an article on www.smartgridawareness.org. A hostile government or other organisation (or even an individual) with a destructive agenda could potentially cause massive disruption to a city or perhaps even an entire country by hacking smart meters or “smart grid” infrastructure. A statement on WEL Networks Ltd’s website gives the impression that it is compulsory to accept a WEL “smart box”. In actual fact, a WEL Networks “smart box” is actually a Landis+Gyr smart meter and there is NO government requirement for WEL Networks to install these so-called “smart boxes” and there is NO government requirement for anyone to accept the installation of a “smart box’. WEL smart boxes may eventually produce microwave radiation more frequently than they do at present, since if Councils in the Waikato area adopt wireless so-called “smart” water meters (see this link and this link for details) the WEL smart boxes could be used to collect and send on the information from the “smart” water meters. If you agreed to the installation of a WEL “smart box” because you believed it was compulsory but do not want to be exposed to the microwave radiation that it produces, you may want to contact WEL Networks Ltd to arrange the removal of the smart box. If you do ask for WEL Networks to remove a smart box, please email through this link to let me know how the company responds. Thank you.